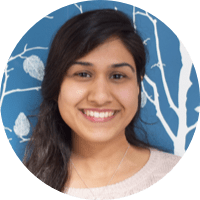 Let’s talk about UX resumes! You may dread the very thought of trying to condense your professional experience into a list of bullet points. Feeling that way about writing a resume is totally natural—I definitely do! Over the years, I’ve tried many different approaches to perfecting my own resume. After some hard lessons learned, I’ve developed a tactical approach to resume writing that I’d love to share with you. I think that resumes, at their core, are about storytelling. Your resume tells a story about what you’ve done in the past. It highlights your role in every project and/or position you’ve held within a company. It talks about how you performed in your role, and what you achieved. It should list the skills you’re proficient in, and some skills you’re in the process of learning. Your resume doesn’t have to be long and writing it doesn’t have to be a chore. With that in mind, let’s start building yours together! 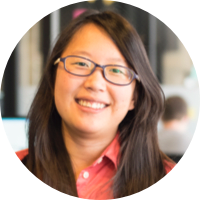 As an example, I’ll write a resume for a fictional UX designer named Raina Machiko. You can download my template here and use it as a jumping off point for your own resume. If I’m considering hiring you as a UX designer, I’d like to know your prior experience, but that’s not the only information I’m looking for. Especially in the realm of UX design, I’m paying close attention to how easy you make it for me to read about your experience. I care about that a lot because making things easy is your job. My experience parsing your resume is directly related to our users’ experience navigating our app. Try your best to answer each question with a single sentence. Your answers guide what you write in your “About Me” section. When you distill them to short, concise bits of information, the intro to your resume is almost ready! Whether you choose to write about yourself in the first or the third person is entirely up to you. Now that you have a solid opening statement, it’s time to move on to your professional experience. 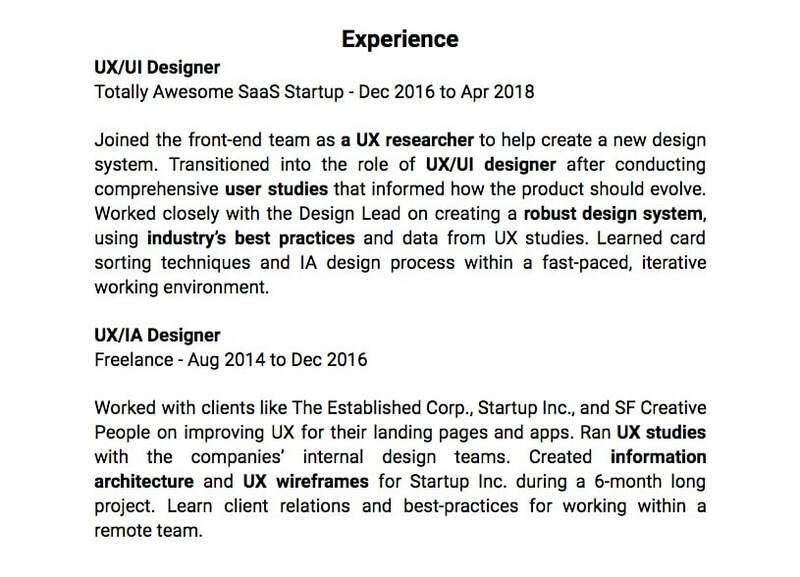 When I see a UX designer resume lands in my inbox, I’m looking for a few things in your “Experience” section. If you’re a freelancer or someone who’s just starting out, I need to know your role on every project you’ve worked on. It’s important to show how you performed in your role and what you achieved. If you’re writing a resume having worked for a company, I’m also looking to see how long you spent with them. Try your best to answer each question in one or two sentences that follow the “what, how, with whom, lessons learned” structure. The what is the goal of the project or the team you’ve worked on. It should also cover your direct responsibilities and the outcome of your work on that team or project. The how is how you approached the work you were directly responsible for. With whom is the team you were part of, and lessons learned is an optional add-on to highlight newly acquired skills. Experience section filled out, it’s time to talk about your skill set. Onward! With a quick glance through your resume, I’ve already learned what you value, how you work, and what you’ve accomplished. The next thing I’m looking to see: the skills you’ve acquired along the way. It’s especially important if you’re just starting your journey to become an awesome UX designer as I want to know what your objective is. You may have seen resumes and UX portfolios that show a person’s skill set in a visual way. Some of them use progress bars or filled-in and empty bullets, while others show dashboard-style radial dials. With your skills broken down by levels (expert, proficient, beginner), you’re now ready to add education and references! Your education should always go after your professional experience. I’m more interested in the projects you’ve worked on and products you’ve designed than in where you went to school. Do you have a degree from an Ivy League university? Awesome. Add it and flaunt it ’cause you got it! 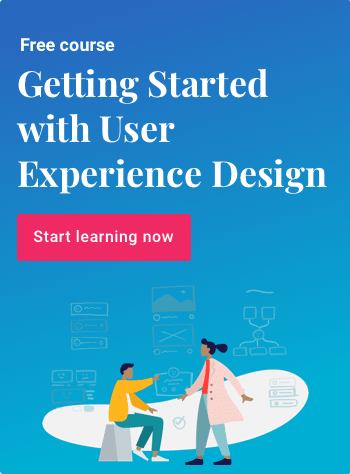 Are you self-taught, having taken all the online UX courses you felt would move you in the right direction? That’s great, too! That tells me that you’re a driven self-starter. You could even change the “Beginner Level” label to “Currently Learning” and I wouldn’t be mad! It would be fantastic for me to see that you’re actively learning new tools and always striving to be better at what you do. And that’s it. 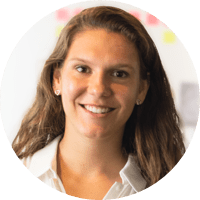 When you approach writing your UX designer resume from a storytelling perspective, you start thinking of your past work experience as a story. Every great story has to start somewhere. In the context of a resume, the starting point should be your “About Me” section. In two to four concise sentences, it should tell me what you value and how you think about your place in the world. Your “Experience” section is the most valuable thing for me to read. Make my reading experience as easy and as interesting as you possibly can. You don’t have to add every single project you’ve ever worked on. At best, it may seem like you’re intentionally inflating your job history. At worst, you’re making me read through projects that have no relation to the position I’m looking to fill, and that’s extremely unhelpful. Your “Education” section is the icing on the cake, but not the cake itself. I’m curious to see where you’ve studied, but that’s not what makes you hireable. The things that do are your experience, how you think and solve design problems, and how you may potentially fit into my team. It goes without saying that you should include links to your portfolio, your email address, and your phone number.